The Australian and French governments are today signing a $50 billion contract that will allow French naval contracting company DCNS to build a fleet of 12 new Shortfin Barracuda submarines. DCNS was announced the winner of Australia's Future Submarine Program (FSP) in April this year, beating Germany's TKMS and Japan's Mitsubishi Heavy Industries and Kawasaki Shipbuilding Corporation bids. 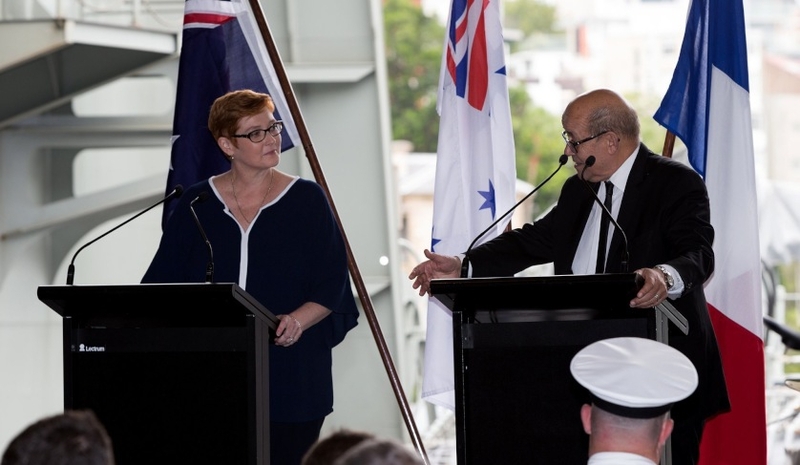 Speaking at a media event at Garden Island in Sydney, Minister for Defence Marise Payne said that the "contract will set out the legal framework under which Australia and France will partner on the Future Submarine Program over the coming decades". French Defence Minister Jean-Yves Le Drian played down the risks to Australia emerging from the India Scorpene data leak, stating that the leak was aimed at harming France and DCNS. "There's obviously an intent to actually harm France," he said during the press conference with Minister Payne. Steel cutting for the future submarines will begin in South Australia in 2022 with the first submarine to enter service for the Royal Australian Navy in the early 2030s.